Gentle reader, I’m pleased to announce that we’ve been celebrating the Bank Holiday here with an event that’s not susceptible to the weather. Kindly join me in welcoming the first ever guest to the blog, Vicki León! This week she took a break from wearing out her shoe-leather exploring the ancient world to tell me some of the things I’ve been wanting to know ever since I discovered her work. I learned that behind the light-hearted approach of Vicki’s books, there’s some serious thinking going on. Your books combine a humorous approach with an obvious passion for your subject. How and why did your fascination with the ancient world begin? I was always drawn to it, even when ignorant of it. As a child/teen, I adored all things Egyptian, later going mad for Greek and Roman as well. Raised in the Pacific Northwest, it wasn’t until I went to live in Spain and I got a whiff of Mediterranean culture that I said, “Ok, now I’m home!” I have an ancient Med soul; not sure why but guess I got left on a doorstep in Oregon by mistake. Eventually I was fortunate enough to live for months at a time in Greece, Israel, and other Mediterranean countries. And to pursue archaeology as a volunteer. When as a distinctly older student I went to college, I made a beeline for the Western Civ and languages departments—again lucky enough to draw really brilliant teachers, who gave me the necessary grounding in the rudiments of historical research and primary sources. I do think, however, that through my serendipitous “field work” and “soaking up the ambiance” years I gained a priceless sense of deep time and ancient settings. 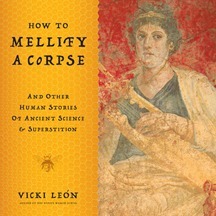 If you had to live in one of the countries and eras you write about in ‘How to Mellify a Corpse’, which would it be and why? There are three places/eras I would give anything to experience firsthand: (a) to be a student of philosopher Empedocles on his native island of Sicily —noted for its gourmet cookery, its marvelous Greek theatre performances, and the divine Mt Etna. (c) to hang out with Pliny the Elder as he wrote Natural Histories, his encyclopedic work–and then get to see the eruption of Mt Vesuvius with Pliny’s nephew, who survived it! (a) I’d be a disciple, and steep myself in Empedocles’ belief system—a gentle mix of early ecology, reincarnation beliefs, and farsighted insights into science and medicine. (c) I’d be one of Pliny’s scribes, and a ‘fly on the wall’ among his circle of Roman and Greek friends; or another sort of fly on the wall as the foodtaster among the paranoid Roman nobility. What’s the thing you would miss most about 21st century life? Chocolate, definitely. Birth control pills (if I were time-traveling as a woman–and didn’t feel confident of the silphium and other strategies they used). What has surprised you most about the ancient world? How unquenchably alive and curious the ancients were; how men and women took childish delight (and fear and astonishment) in the smallest things, like magnets and portents, dinner parties and griffins, the dawn sky and the night sky. How very human they were, and aware of their flaws and defects; how very much they longed to be remembered and how accepting/unflinching they were in the face of hardship, tragedy, and death. Maybe I am romanticizing but I do base part of my belief on the Greeks and Romans and Mediterranean folks with whom I’ve mingled over the years; and the Zorba spirit of the ones who currently live there. Have you ever been tempted to try any of the skills or cures you’ve discovered? I’d love to see one of the Great Comets that appeared over the skies of Italy, such as the one in 44 BC, and have a sage interpret it for me; or to hear a prophecy from the lips of the Pythia of Delphi, or to see an entrail reading up close. I’d love to be on the wharf and see one of the great superships of antiquity pull in, or spend a week with an alchemist like Mary Profetissa of Alexandria. And of course I’d adore seeing just how Alexander the Great got embalmed in honey! In what ways do you think we’ve made progress over the years? (Or have we?) What have we lost? What we’ve gained is of course an awareness of individual dignity and liberty; being born a slave or a woman would have been a chancy, often heartbreaking life, two millennia ago. One of the things we’ve lost: the Greeks really understood the art of creating communities of an almost-perfect Goldilocks size—intimate yet vibrant. Another thing we’ve lost: the knowledge of what we don’t know about them. We continue to stumble across heretofore enigmatic things from ancient life that prove to be astonishing technological achievements. Examples: the Antikythera mechanism, the first analog computer; the secrets of Roman concrete; the acoustic abilities of the Greeks; the still-puzzling accomplishments of artisans who worked in micro- environments and the use they made of rock crystal and other aids. All too frequently, people in the media make a fuss about “new” pronouncements and theories about headliners such as Cleopatra. As you and I and other writers and researchers and historians know, there are thousands of Greco-Roman items from ancient times still unidentified or miscategorized in museums around the world. I’m in awe of your ability to garner huge amounts of information and not lose it down the back of the desk/in a computer crash/in the recesses of a busy mind. Are you very organised? I don’t think of myself that way. My home office is a study in chaos but visitors are awed (or perhaps just confused) by my colossal numbers of files and file cabinets. Three different summers in the 1990s, when I went to the Stanford Professional Publishing course, I was told we would ‘soon’ live in a paperless society. Now, eighteen years later, I find that I have Mt Etnas of paper documents along with a frightening virtual Etna of electronic files. What happened? What’s the question you wish somebody would ask in an interview but nobody ever does? It’s on pages 72 – 76 of Mellify, the story of the valiant citizens of the island of Rhodes who fought off a great bully and his vicious siege—then turned the enemy’s abandoned war weapons into something beautiful for the ages. Instead of swords into plowshares, they created the Colossus of Rhodes, a shimmering 120 foot statue of their patron, Helios the sungod. It became one of the seven World Wonders; even after an earthquake broke it off at the knees, the Colossus remained a global attraction. The French sculptor of the Statue of Liberty, who was grounded in the classical tradition, used many aspects of the Colossus of Rhodes in our own welcoming beacon. Today, others are emulating the Rhodians by turning some of the world’s most deadly weapons into something peaceful and beautiful. How grand if we could all be inspired by their example. That’s a great place to close. Thanks, Vicki. Fascinating interview Ruth! I also really loved Vicki’s book. Its thematic organisation really helped keep the multitude of facts in a cohesive narrative. I particularly like your “What’s the question you wish somebody would ask you?” question! If I ever use it in one of my interviews I will quote you as the inspiration for it. Thank you, I’m glad you enjoyed it! It was my first ever interview and there’s definitely more to asking questions than meets the eye, isn’t there? Interviews are a wonderful way to showcase the interesting persons behind the subject matter. I am always fascinated by the real person behind anything, be it a book, painting or blog! Vicki was also my first interviewee on my own Art+History blog – if you haven’t seen it – feel free to have a look! That’s not only an interesting interview but beautifully presented… thanks for the link. Very nice interview, congrats to both of you. I especially like the question about what Vicki would miss most if she travelled to the ancient world. I’d agree that chocolate and the Pill would be hard to do without, and I’d add tomatoes, which we think of as typically Mediterranean now, and, (as I like horse-riding,) lack of stirrups would be a real drawback. Thank you Jane. Yes, tomatoes would be a dreadful loss, and the existence of fish sauce would be no compensation. Good point about the stirrups. I know we’re told horses were smaller in the ancient world, but getting onto one would be quite tricky for an athletically challenged person like me (let alone staying there).